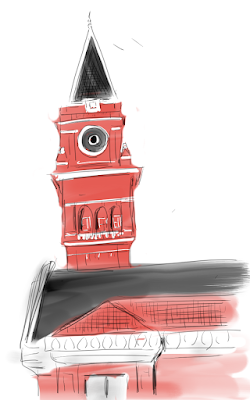 Despite the crowds and rain I did get a few sketches in today. 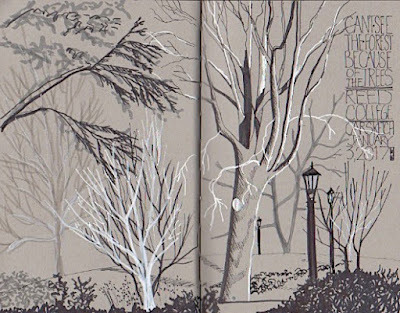 I don't usually put people in my sketches but for this I psyched myself with a look through Gabi's People in Motion Urban Sketchers book. And the event was all about the people! 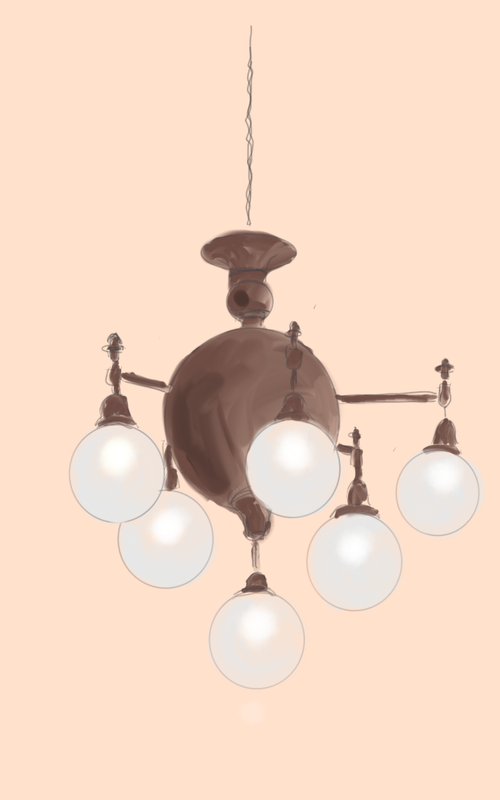 It paid off for the most part....although I feel some of the sketches are incomplete. 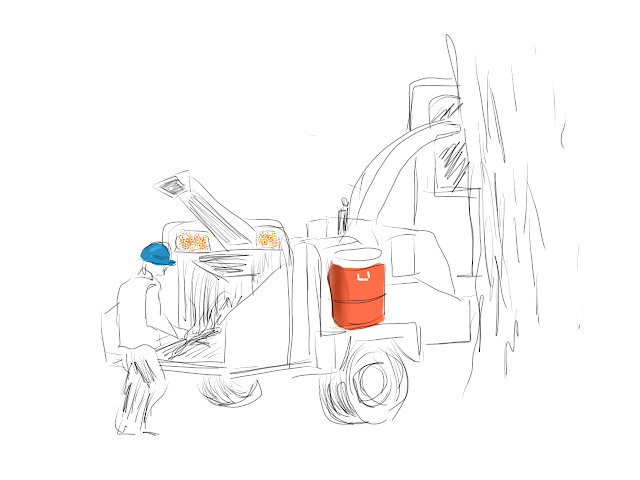 That's just the main trunk, reaching halfway across the street. Before PGE chopped it up, it reached all the way across the street, with the crown coming to rest between two houses. That was the worst damage in the neighborhood. 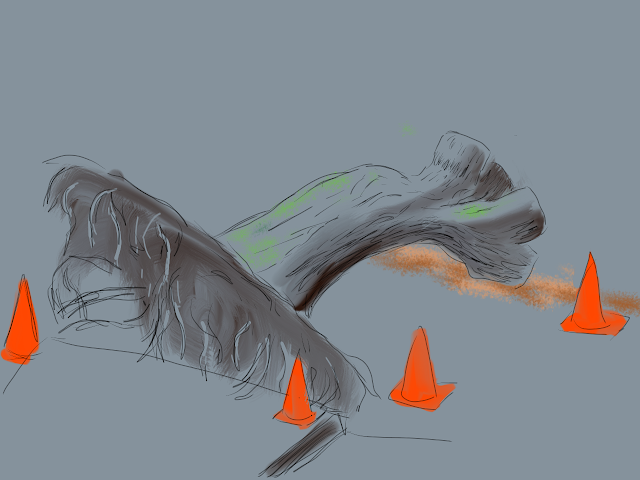 But limbs fell all over. This morning was the first day that a tree service felt was warm enough that they could bring in a chipper to deal with some of the brush. I went up to Seattle on Saturday, for a concert. 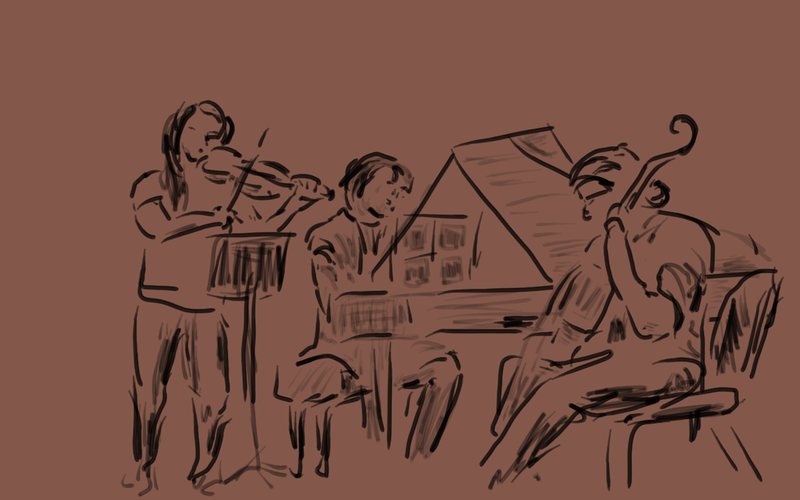 This sketch wasn't from the real concert, but from the pre-show. A mini-concert held while people were coming in for the real thing. 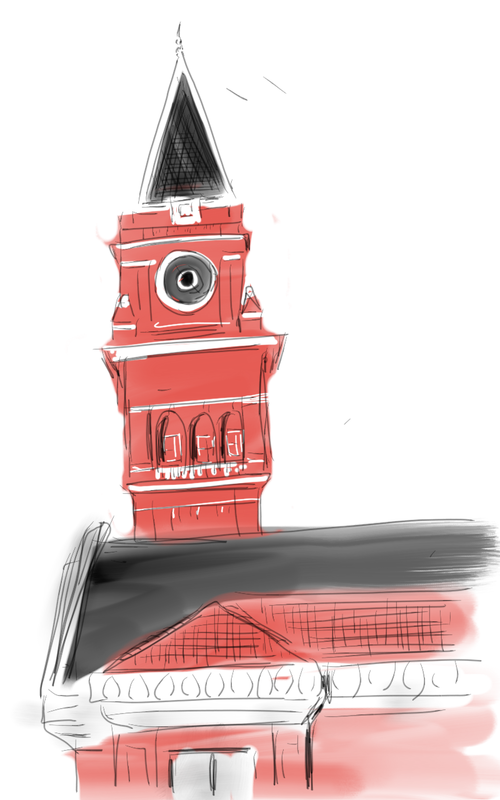 Then, the next morning, King Street Station from the hostel's common room. And, a bit later, inside the station, looking up at the big chandelier above the entrance. Some of our members are interested in the Women's March on January 21. 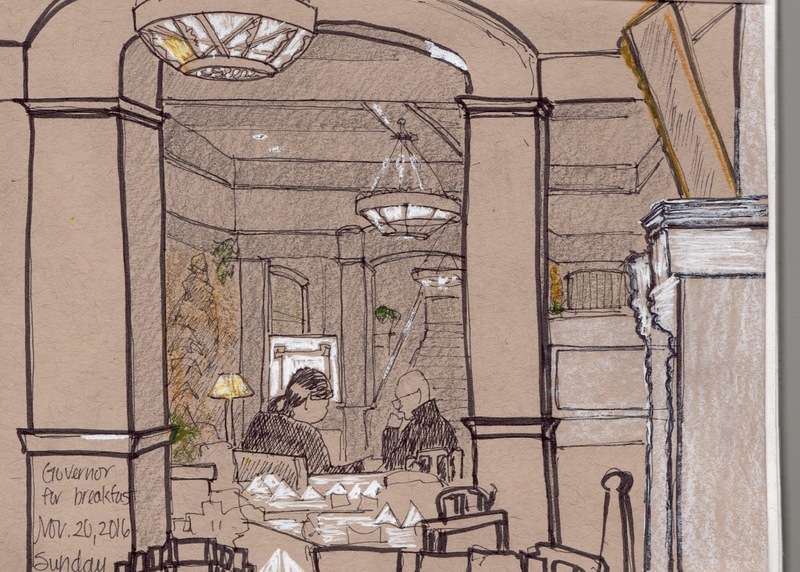 To make that easier, let's meet and sketch near the gathering place for that event. 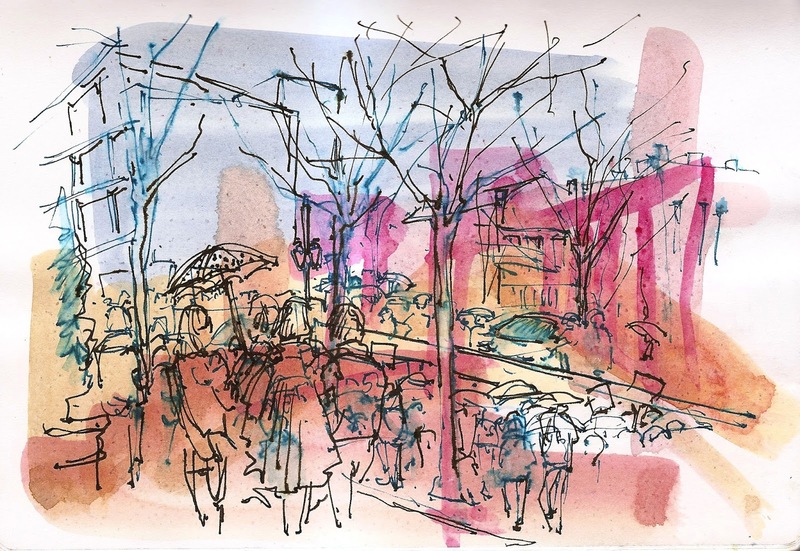 It's also an opportunity for some Reportage, and telling a story through drawing. 10:00am - Meet at Floyd's Coffee (118 NW Couch St.) for coffee, snacks, and socializing. 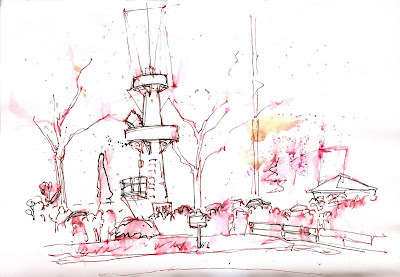 10:30am - Sketch along the waterfront or around Old Town / Chinatown from 10-noon. 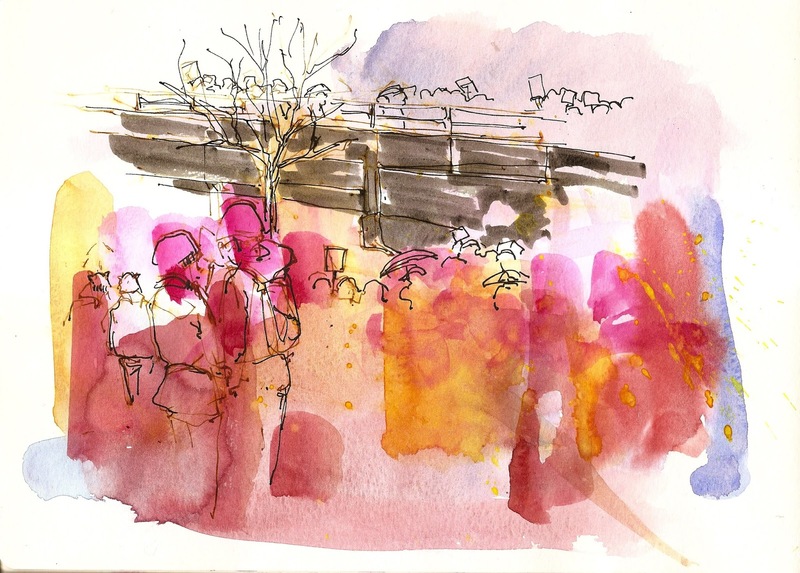 Political Reportage Option - Sketch the Women's March at the Waterfront. Starts near the Morrison Bridge. 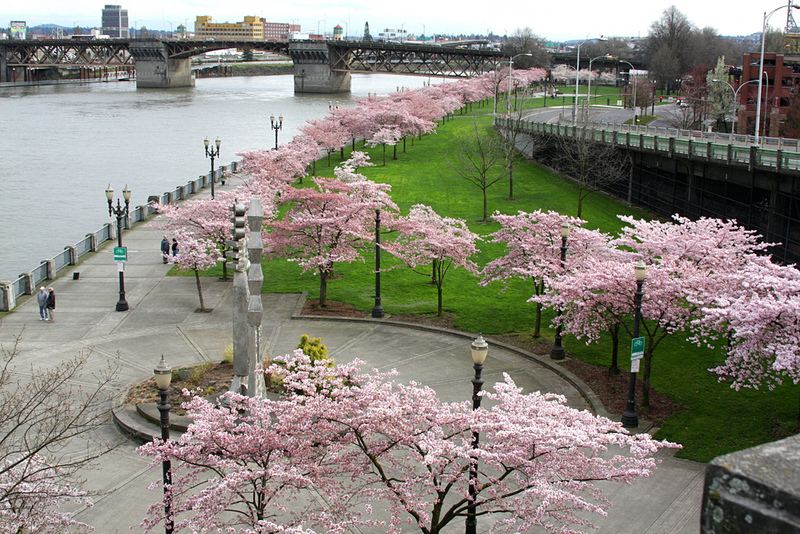 Good Weather Non-Political Option: Grab food from somewhere and meet/eat at Bill Naito Legacy Fountain near Burnside Bridge. 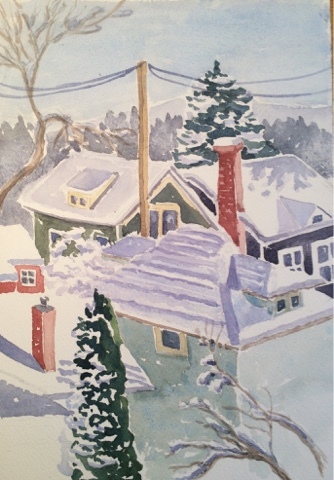 I did this watercolor from our living room. I enjoyed trying to capture the shadows on the snow. 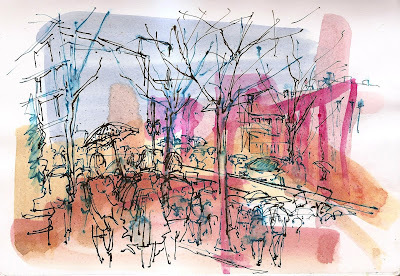 Urban Sketchers Workshops starting April 29th! 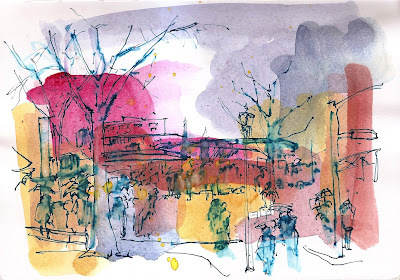 Urban Sketchers celebrates 10 years, and we want to celebrate introducing the first long term USK course ever! 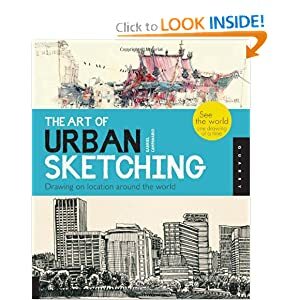 We invite all sketchers around the world to attend ten on location classes with a USK official instructor/s nearby your city to learn or improve the core value of Urban Sketching: sketch the world, one drawing at a time. 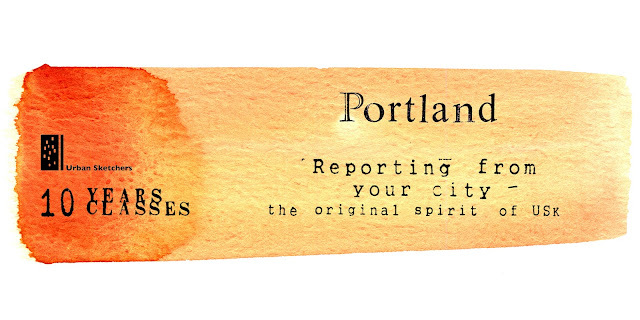 The series of workshops “Reporting from Portland” is designed to highlight concepts, city scenes, and cultural and urban phenomena that came to symbolize Portland both to its inhabitants and to the outside community. We will learn how to create visual narratives starting with smaller objects and concepts, progressing to drawing larger architectural landmarks and street scenes and finally culminating in a full reportage about the life of our city with the stories about neighborhoods, markets, and street festivals. Yesterday I had this nice sunny view from my living room window. I hope you're all enjoying this weather as much as I am. 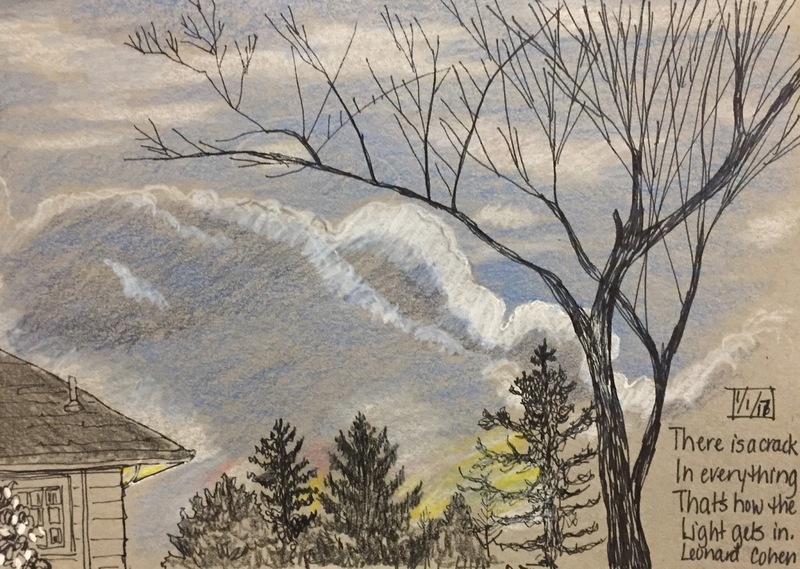 The tree shapes against a dramatic sky enticed me to draw from our landing. 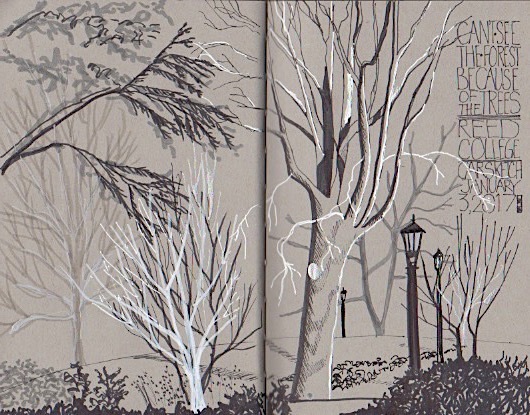 There was a jungle of bare branches at Reed College, easily visible from inside our heated, parked car. 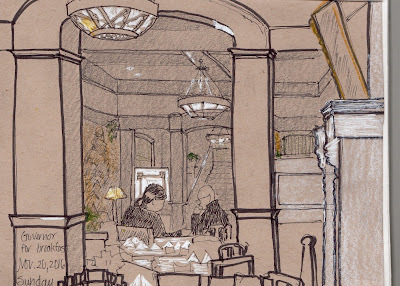 The Governor Hotel is a nice warm place to eat and sketch on a chilly day, too. 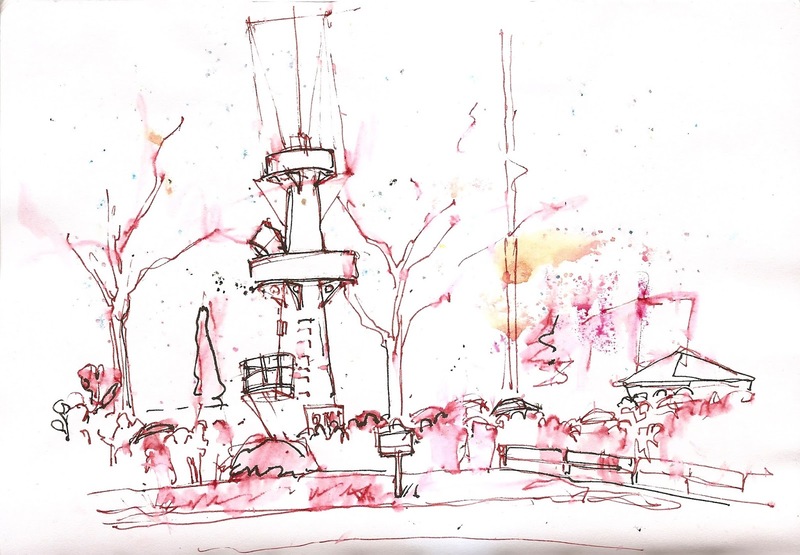 Let's start the New Year sketching an area that has seen a lot of new building recently: N. Williams and Fremont. The curvy "1 North" building is there. 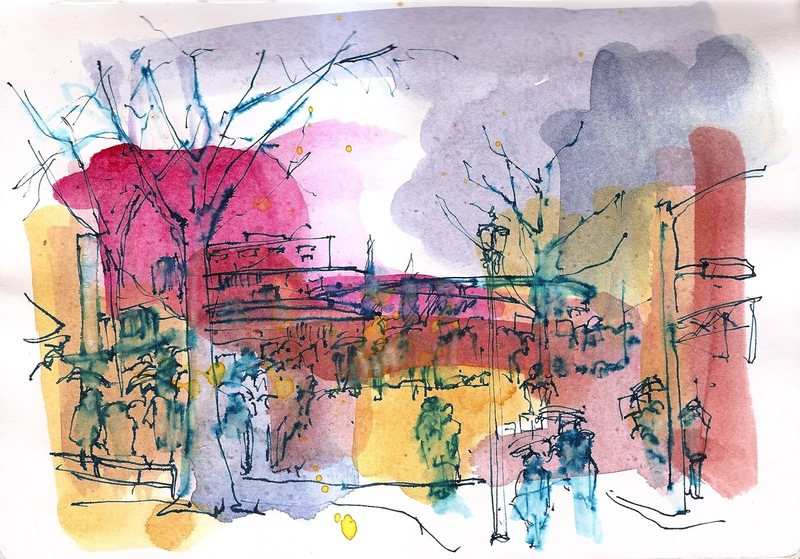 Other things to sketch: food carts at N. Vancouver, newer development along Williams, groceries inside New Seasons. If the weather is bad we can stay inside New Seasons and sketch each other and the views out the window. 10:00am: Meet at New Seasons, 3445 N Williams Ave, for introductions / coffee / snacks - at the seating area near the north side of the store. 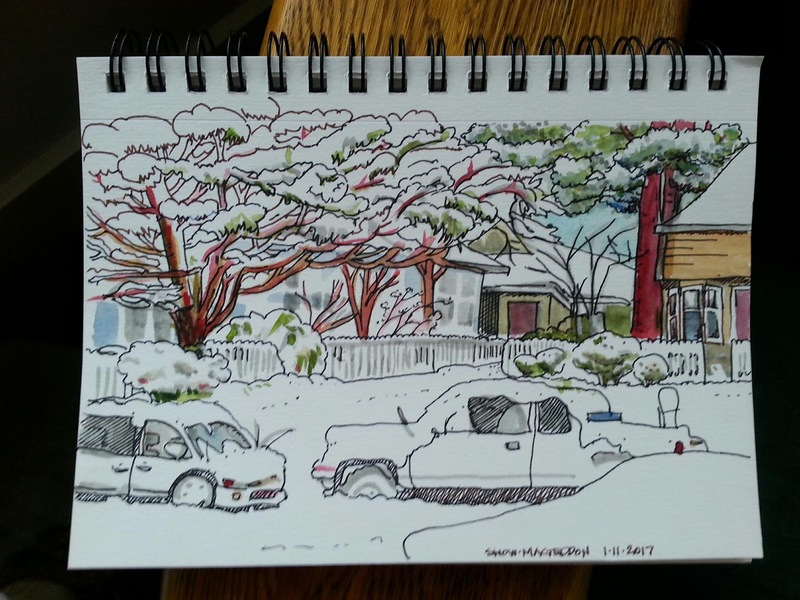 10:30am: Sketch around Courtyard at 1 North, N Williams and N. Fremont. 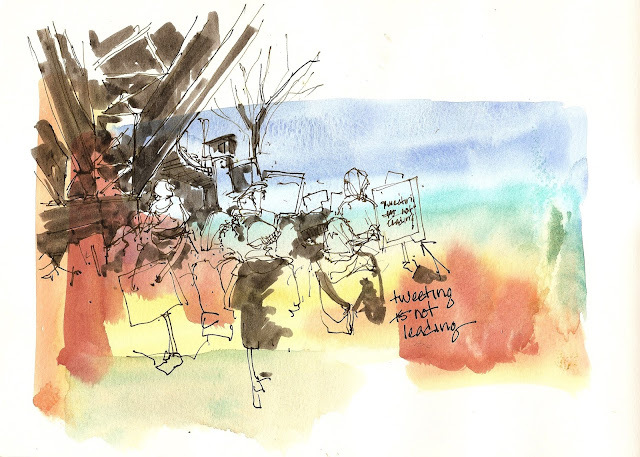 12:00 noon: Optional - Meet at Pizza A-Go-Go, 3240 N Williams Ave, for sketchbook sharing / lunch. Should be plenty of places to sit.